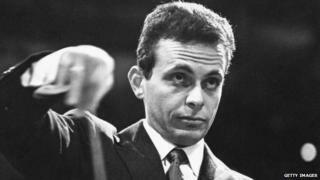 Lorin Maazel, widely seen as one of the greatest modern conductors of classical music, has died in the US, aged 84. The American occupied top positions at the Vienna State Opera and the New York Philharmonic, which he accompanied on a 2008 tour of isolated North Korea. In 2009, he and his wife founded the Castleton Festival, which aims to showcase classical musicians at the start of their careers. Maazel was admired for the precision and rigour of his conducting. According to a 2011 profile in The Guardian newspaper, he had a powerful memory and became known for performing without a score. "In fact the hardest part is trying to forget music when I'm not conducting it," the newspaper quotes him as saying. "I don't want to be conducting Mahler with my head stuffed full of 10 million notes from other composers." Maazel was born in France in 1930. As well as conducting, he also composed music, producing an opera based on George Orwell's novel, 1984. He died as a result of complications following pneumonia, according to the website of the Castleton Festival.